ONE of the nation’s top judges has called for a separate, less ­formal tribunal to deal with family law cases involving extreme domestic violence, arguing that the current adversarial system is not the right place for women who have been badly abused. Federal Circuit Court chief judge John Pascoe told The Australian he ­believed a new approach was also needed for cases involving serious mental illness. “I wonder whether some sort of tribunal where there can be a ­different sort of approach that reduc­es the trauma of having to perhaps be cross-examined on really, ­really often horrific events would work better,’’ he said. The Federal Circuit Court ­handles most family law cases and deals with domestic violence and mental illness every day, including in the context of parenting ­disputes. Chief Judge Pascoe said he worried that a formal, adversarial court environment did not encourage maximum disclosure by women who had suffered domestic violence. “Part of the tragedy for battered women in particular is often they are very reluctant to disclose (what has happened to them),” he said. 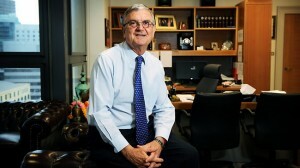 “We have an adversarial system, where each person is entitled to hear the evidence of the other, and some women feel very, very threatened by that.” Chief Judge Pascoe said he had a “similar concern” that the advers­arial system was not necessarily the best way to determine disputes involving people with a serious mental illness. Chief Judge Pascoe’s call for a separate tribunal for cases involving domestic violence comes after the NSW Director of Public ­Prosecutions, Lloyd Babb SC, told the royal commission into child sexual abuse that a separate court for sexual assault should be established. Mr Babb said that some judicial offic­ers and prosecutors were better at handling those cases than others. Chief Judge Pascoe said proper Legal Aid resourcing was also crucial to assist women who had experienced family violence. “Things like Legal Aid resourcing become very, very important so those women feel protected,” he said. Those calls were echoed yesterday by former Family Court chief justice Alastair Nicholson, who said judges did their best to be sensitive in cases involving serious violence or sexual abuse but sometimes the set-up of the court was “too formidable”. “I think there’s room for a lot less formality and a better structure in those sorts of cases,” he said. Mr Nicholson believed cuts to Legal Aid funding had exacerbated the problem. “You’ve got the unfortunate situation for someone who’s the victim of domestic violence being cross-examined by the perpetrator and it’s quite terrifying,” he said. “We ­really should address those issues. Domestic violence advocates have backed calls for changes to the way courts approach serious family violence, with some calling for a separate tribunal to handle such cases and others calling for more help for women to navigate the system. North Queensland Domestic Violence Resource Service director Shirley Slann believed judges and magistrates in the criminal and family law systems, as well as police prosecutors, needed to be better trained so they understood family violence. Women’s Legal Services NSW executive officer Helen Campbell said resources should be directed to provide extra support for women to navigate the current system, rather than on creating a separate tribunal. The person who will make a final decision about your case if it goes to a trial.